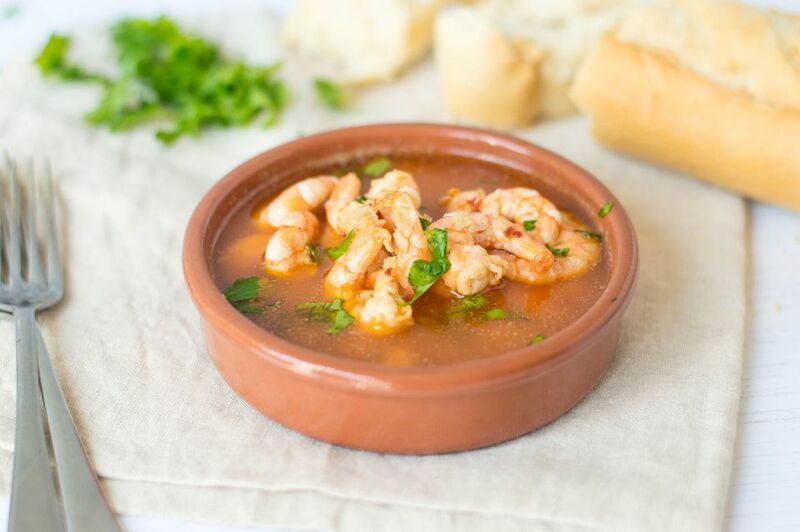 One of the most popular tapas or small plates in all of Spain, gambas al ajillo, the Spanish take on garlic shrimp or prawns, is actually simple to make at home. The recipe is quick, easy, and full of garlic flavor. It is truly a classic Spanish tapa, with slight variations throughout the country, and enjoyed in tapas bars all over Spain. To make this popular dish, fresh shrimp are sauteed in olive oil and lots of garlic (this is a recipe for garlic lovers—add even more if you dare), with a touch of dried cayenne pepper, which gives the sauce a slight bite. In varieties of the recipes, a dash of Spanish paprika and a splash of brandy are included. This garlic shrimp recipe varies throughout Spain, many regions feature local ingredients that reflect the culinary identity of that region. This shrimp dish should always be on the menu when you invite friends over—as an appetizer or main course—and you can almost guarantee there will never be leftovers. Do not forget to serve with a nice crusty bread for sopping up the sauce. In a saute pan or heavy frying pan, warm the olive oil over medium heat. Add the garlic and red pepper flakes and saute for about 1 minute or until the garlic just begins to brown, being careful not to let it burn. Raise the heat to high and immediately add the shrimp, lemon juice, and optional brandy and paprika. Stir well to coat shrimp, then saute until the shrimp turn pink and start to curl (about 3 minutes). Remove from heat and season to taste with salt and freshly ground black pepper. Transfer shrimp with oil and sauce to a warm plate or serve straight from the pan. Sprinkle with chopped parsley and serve with the fresh bread. Careful with the sauce: As the sauce is a vital part of this recipe, it is important that you do not cook down the oil, or burn the garlic which will impart a bitter taste to the dish. So make sure you are simply warming the oil and garlic and not really cooking it. Shells on or off: In Spain, gambas al ajillo is prepared with the shells on or off depending on the chef. This recipe calls for keeping the shells on, but if you prefer, you can peel the shrimp before cooking. If you do, consider leaving the tails on, as this makes the dish more attractive and easier to pick up the shrimp with your fingers. Frozen shrimp: If using frozen shrimp, rinse under cold water and pat dry. Allow for a longer cooking time for shrimp that are not completely thawed, and be sure to cook thoroughly. Large shrimp or other seafood: If you prefer larger shrimp, you can purchase jumbo shrimp which will have a lower count per pound. However, 25 to a pound are a good size for this recipe. The garlic sauce is also delicious with other types of seafood such as squid and scallops. Regional substitutions: In Seville (in the Andalusia region), the dish is prepared with manzanilla, a favorite local sherry. In other parts of Spain, you will find brandy, sweet paprika, different varieties of hot peppers (or none at all), or lemon juice on the ingredient list. Gambas al ajillo is also called camarones al ajillo and is sometimes traditionally served sizzling hot in a little metal pan. Gambas means "prawn" and camarones means "shrimp."